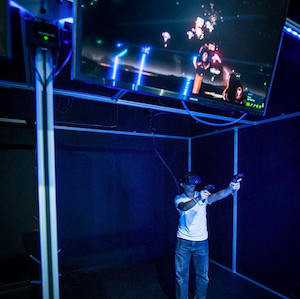 The Canadian city of Brampton has just got its first virtual reality arcade in the form of Ctrl V.
The 4,000sq.ft facility has 25 different experiences including games, with a plan to have 50 within the next six months. These games include archery, space shooters and first-person shooters. Other experiences allow visitors to explore different areas of the world and simulate other scenarios. Games like Cowbots and Aliens, Beat Saber, and Electronauts are ideal for kids or first-timers – there’s an 18+ age filter for gory content. Meanwhile, games like The Brookhaven Experiment and Affected: The Manor are more suited to older kids and adults. The site also facilitates multiplayer games like Kiss or Kill VR and the Virtual Dodgeball Smashbox Arena. Visiting the centre costs CAD$25 for an hour. This is the only fee for play, customers can use any of the amusements during their allotted time. A statement from the business said one of its focuses will be “creating a space that’s welcoming and accessible for everyone.” Ctrl V also have sites in Ontario, Manitoba, Alberta and New Jersey.